Dutch chemicals firm DSM has opened an R&D centre for high-performance materials on the Brightlands Chemelot Campus in Sittard-Geleen, the Netherlands. The completion of DSM’s largest materials centre worldwide is part of the EUR100 million investment in knowledge and innovation in the Netherlands that DSM announced in May 2012. The centre employs over 400 knowledge workers and combines technological skills and expertise unique in the Netherlands for use in applications the world over. 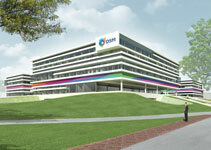 The materials centre is said to be an important base for DSM’s Materials Sciences research and marketing activities. Historically, Sittard-Geleen has been the main centre of DSM’s high-performance materials research. In addition, being located on the Brightlands Chemelot Campus offers opportunities for open innovation owing to the proximity of other start-up and established companies as well as research and education institutes. DSM materials are used in applications and products all over the world; from connectors in electronics, surgical sutures and medical implants to heat-resistant plastic engine parts for the automotive industry, smart food packaging material, solar panel coatings and super-strong fibres in, for instance, cables. The materials need to be not only safe and superior in quality but also have a positive impact on people and the environment. An example: almost a third of our food gets wasted. Smart food packaging helps extend shelf life and avoid food wastage. Using its Arnitel product, DSM Engineering Plastics has developed a breathable packaging that controls the mixture of moisture, oxygen and CO2 in, for instance, packaged lettuce. As a result, the lettuce goes into a type of slumber and lasts much longer thanks to the smart packaging. Another example is Dyneema. Said to be the world’s strongest fibre, it is at the same time extremely light and flexible and has many innovative applications, for instance in cut-resistant gloves, shipping ropes and bullet-resistant vests. DSM is always on the lookout for innovative new applications for this fibre, one example being an automatic tsunami barrier. The barrier could be installed along the coastline anchored in a trench behind the beach. When the tsunami tidal-wave arrives, the force of the water immediately causes the membrane with Dyneema to unfold, while a float drags it upright. The float is kept securely in place with Dyneema cables. This rapidly creates a high wall stopping up to 20 m of water, thus preventing casualties and material damage. Dimitri de Vreeze, member of the Royal DSM’s Managing Board also said that other focus of materials research is on lighter, high-quality materials that replace steel in cars and reduce energy consumption, smart packaging that helps prevent food being wasted, and materials made from biobased rather than fossil resources, helping to facilitate the circular economy.